As you can see from the brief highlights video above, our team has been working diligently on this year’s robot build, programming challenges, and game strategies, as well as video and written award submissions. We intend for our robot to perform well in this epic FIRST STRONGHOLD competition. 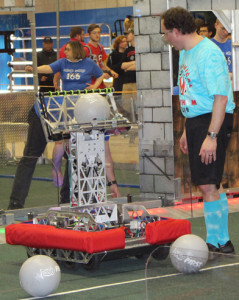 With a robust eight-wheeled drive train and a linear shooter, our robot executes the game strategy of defeating as many opponent’s defenses as we can while opportunistically scoring boulders (balls) in our opponent’s tower. The team purchased and built a 3D printer which several students have used to create parts for the robot. Our team will be competing in two district events this year, and we would be thrilled if you have the opportunity to visit our local competition, the UNH District Event. This event, free to the public, takes place March 25-26 at the University of New Hampshire Whittemore Center in Durham, NH. We would love to see you there visiting the pits, watching matches from the stands, and enjoying the energy of the competition!